In an area of China not known to ever contain people, let alone industry, there are three mysterious triangular openings on top of a mountain containing hundreds of ancient rusty iron pipes of unknown origin. Some of the pipes go deep into the mountain. Some of them go into a nearby salt water lake. There are more pipes in the lake, and more still running east-west along the lake shore. Some of the larger pipes are 40 cm in diameter, are of uniform size and are placed in what seems like purposeful patterns. Archaeologists have dated the pipes to a time before people had figured out how to cast iron. Some of the Baigong Pipes are reported to be associated with three caves in Mount Baigong. These caves are reported to occur within the front face of Mount Baigong. The mouths of the two smaller caves have collapsed. Only the largest cave, which is 6 meters (18 feet) high, can be entered. The vague resemblance of the top of Mount Baigong to a pyramid has been the focus of much fringe speculation. Two Baigong Pipes have been reported from the largest cave. One of these is described as being 40 cm (16 in) in diameter and preserved as a reddish-brown "half-pipe". Within the same cave, another pipe-like feature of similar diameter was also found. "Dozens" of upright pipe-like features, about 10 to 40 cm (4 to 16 inches) in diameter, were also found protruding from Mount Baigong above the largest cave. Additional Baigong Pipes were found on shore and within Toson Lake, which lies 80 meters (260 feet) from the mouth of the largest cave. On the beach of Lake Toson, about 40 meters (130 feet) from the mouth of the largest cave, apparently flat-lying, hollow, pipe-like features were found. These reddish-brown pipe-like features range in diameter from 2 to 4.5 cm (0.8 to 1.8 inch) and have an east-west orientation. Another group of pipe-like features, presumably vertical, either protrude from or lie just below the surface of the lake. Associated with these pipe-like features are "rusty scraps" and "strangely shaped stones". Analysis of the "rusty scraps" by Liu Shaolin at a "local smeltery" reportedly found that they consist of 30 percent ferric oxide and large amounts of silicon dioxide and calcium oxide. Because any metallurgical analysis reports the composition of a material analyzed, not in terms of the actual minerals comprising it, but only in terms of percentages of the oxides of the specific elements present, the calcium present in the "pipes" could have been in the form of calcite, a mineral that naturally forms concretions. According to news stories, the pipes were first discovered by a group of scientists from the United States who were seeking dinosaur fossils. Allegedly, these still unidentified and anonymous scientists reported the pipes to local authorities in Delingha. However, the pipes were ignored until a report, possibly one of six made, by Ye Zhou, appeared in the "Henan Dahe Bao" (河南大河报 Henan Great River News) in June 2002. Quin Jianwen, a local official, discussed the pipe-like features with journalists of the Xinhua News Agency on June 16, 2002. The local government now promotes the pipe-like features as a tourist attraction, with road signs and tourist guides. According to an 2003 article in the Xinmin Weekly Chinese scientists using atomic emission spectroscopy found the Baigong Pipes to contain organic matter of plant origin. 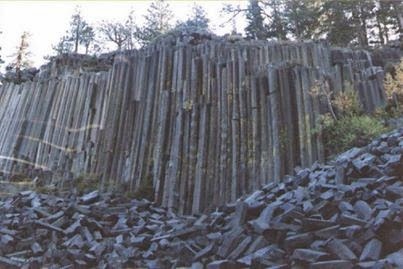 In addition, the news article also stated that tree rings were found in sections of these rock formations and, as a result, they were judged to be fossil trees or tree roots. However, like many other aspects of the Baigong Pipes, this news report remains unsupported by either any scientific publication or other reliable primary or secondary source that discusses and documents these findings in any detail. The state run newspaper People's Daily reported on a 2007 investigation; where a research fellow from the Chinese Earthquake Administration reported they had found some of the pipes to be highly radioactive. Natural pipe-like features, which are virtually identical to the Baigong Pipes, occur in the Navajo Sandstone and other sandstones of Southwestern United States. The bleached sandstone seen in the cave entrance is typical of sandstones in which natural pipe-like features have been found. Beitler describes them as hollow "subhorizontal planar strata-bound pipes" and "vertical pipes." They range in size from less than 1 cm to greater than 50 cm in diameter and their walls are as much as 1 cm thick. They extend through the Navajo Sandstone for more than several meters. They are regarded as having formed as the result of the dissolution of siderite cements and the redistribution and oxidization of the released iron by groundwater flow. Hematite also occurs as other masses of diagenetic "ironstone" that exhibit a wide and amazing range of bizarre shapes, which can be described as both "strangely shaped stones" and "rusty scraps". Strangely shaped stones, pipe-like features, and other concretionary masses have been observed and described from the Navajo and other Jurassic sandstones in Utah and adjacent American states. The reported composition of the rusty scraps, 30 percent ferric oxide and large amounts of silicon dioxide and calcium oxide, is consistent with the hematite masses found in the Navajo and other Jurassic sandstones in Utah and elsewhere in the Southwestern United States. The ferric oxide and large amounts of silicon dioxide is what a person would expect iron oxide cemented sandstone to consist of. Calcite and other carbonate cements and concretions are typically associated with the hematite masses in the Navajo and other sandstones and sedimentary rocks. Cylindrical structures very similar to the Baigong Pipes have also been found protruding from outcrops of Pliocene Citronelle Formation in the Florida parishes of Louisiana and in older Pleistocene fluvial sediments within South-central Louisiana. These structures are as much as 70 cm in diameter and 100 cm in depth. Detailed studies of these cylindrical structures found that they were created by the formation of ironstone rims around tap roots of pine trees by soil forming processes.